Iron Men In Wooden Boats the “History of Small Boat Minesweeping” was something I wanted to document for posterity, so that my shipmates would not be relegated to the “dustbin of history”. In planning my book I have not found publishers willing to publish a book to accommodate the wide range of media that my research had uncovered, so as I accumulate and create multimedia presentations, I will offer samples on this blog, in no particular order, to stimulate interest in my book, and hopefully additional content contributions – that document the History of Small Boat Minesweeping”. Register for blog updates, and info regarding my book “Iron Men In Wooden Boats”. I copiled this collection of photographs, posters, and cartoons and put them to music trying to show publishers that Iron Men In Wooden Boats can be enriched with information not normally included in books. The publishers were still not ready in 2006 to include a DVD in any book, because it had been done previously, and the pilferage of disks ruined the value and shelf life of their publications. They also objected to adding cost to the publication. So, as I research and write, I am still thinking of how to provide these multimedia items that would be outtakes in a normal published book. I am experimenting with this blog, by posting movies, and many of the backgorund research items that would normally only appear in a bibliography or index, and maybe by the time I finish the book – the answer will be obvious. At the moment, a website organized by chapters, or a DVD Set to complement the book may be in order. But, who knows what technology will spawn in the future. BTW: The Sin Do Island, North Korea Invasion using COMINRON 3 LCVP’s to deliver Republic of Korea infantry, may be one of the only beach invasions made by minesweeping boats in Korea. The MR3 LCVP’s have their bow ramps welded shut, which made it very difficult for the ROK troops to disembark. It was a good thing that North Korean troops were inland! I created this video to honor Wesley “Dutch” Schultz Retired BMC following his death recently. He was a great guy and I regularly interviewed over the years before his death. I visited him in Southern California and he loaned me a lot of photos of his tour in Mine Sweeping Boat Division ONE in Sasebo. Actually, he arrived in 1950 when the boat divison had not formed yet, and it was officially designated COMINRON THREE boat division. Dutch was a battleship and aircraft carrier sailor in wWII. He was a BM2 and a Boat Captain in 1950 when arriving in Sasebo. Their boats were carried by APD’s, LST’s, LSD’s, and once late in 1950, slung crossways on the stern of an ASR. As you can see on the video, his crewmembers kept track of the Russian mines they swept in Korea. MSB ONE and COMINRON THREE AMC’s maintained an 800 day seige of Wonsan North Korea throughout the entire war. The U.S. Navy’ minesweeping forces keeping the vital waterway open between Vung Tau and Saigon were the 57′ MSB’s of Mine Squadron 11 Detachment Alpha from their base at Nha Be, SVN. Since the Korean War when the Boat Division of COMinRon Three was formed in Sasebo, Japan in 1950 this Division started with two 40′ motor launches from the USS Boxer, and a fourteen 36′ LCVP’s delivered to the Chinnampo sweep by the USS Catamounnt. Early in 1951 the Boat Division was re-named Mine Sweeping Boat Division ONE, and continued with that designation until the Korean armistice. Succeeding them following the Korean Armistice was Mine Division – 111 which had almost totally converted to 50′ Motor Launch Minesweepers, heavily modified by Ship Repair Depot in Sasebo with decks, some with enclosed pilot houses and masts. They were forced by Navy wisdom to relinquish their MSB designations (Mine Sweeping Boats) and reclassify their boats as Motor Launch Mine Sweepers – MLMS. This was due to BuShips having given the MSB designation to a new 57′ minesweeper class they were developing. In 1958 these boats were replaced by newly built 36′ Mine Sweeping Launches (MSL’s), powered by Boeing Gas Turbine Type 502-10C. Twenty MSL’s were delivered to WestPAC split between Sasebo and Long Beach, CA. Following this re-organization their LCVP’s and MLMS’s were given to Taiwan, Korea, and Vietnam. The Division was re-named Mine Division – 33, and in 1961 the USS Epping Forest LSD-4, was transferred to MinFlot 1 in Sasebo and re-designated MCS-7. Mine Countermeasures Support ship. 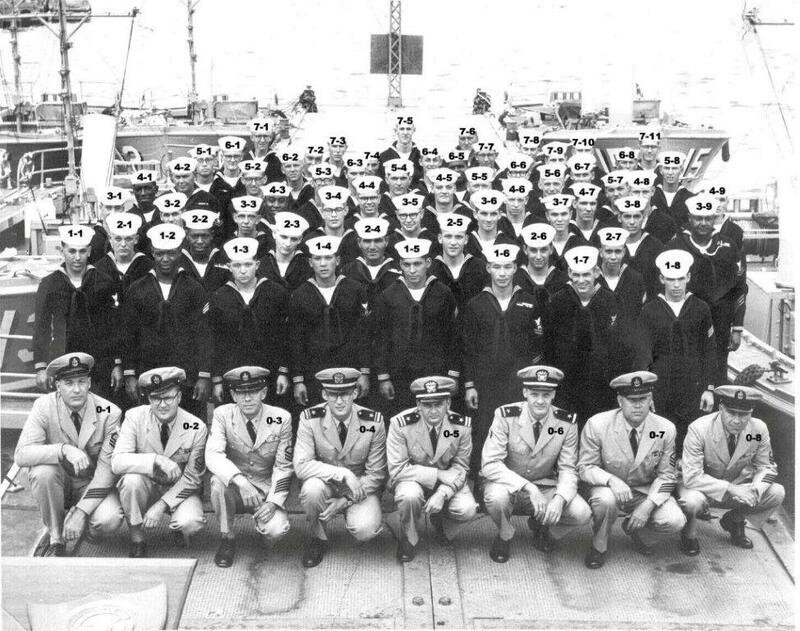 In August 1966 MinDiv – 33 was decommissioned and tranferred aboard the USS Epping Forest mCS-7 as the Boat Division. In Fall of 1968 the USS Epping Forest was de-commissioned. The Boat division was sent to the Sasebo Seawall for the winter. The following Spring the USS Catskill MCS-2 arrived in Sasebo as the new mothership. During which in the waning budgets due to Vietnam, the Catskill was decommissioned. Minesweeping Boat Divisions homeported in Sasebo no longer exist. 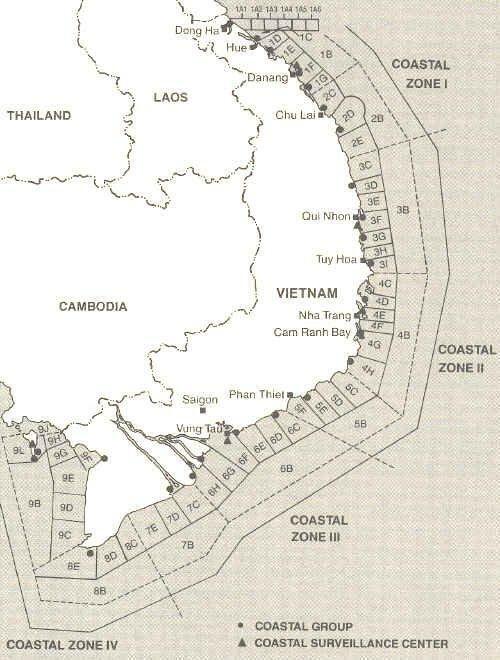 At some point during the Vietnam War Operation Market Time divided the Coastal Areas into Patrol Sectors so Market time units could be assigned patrol areas, and to produce nightly reports on patrol activities for the day. When standing the early 1966 mid-watch on MSC-207 USS Widgeon, I recall having to obtain the Captain’s signature on the form, and it was then submitted by the RM for transmission, I assume to our assigned Coastal Surveillance Center. As a first hand witness to 24/7 junk searching, this report was the Navy’s “body count” equivalent. As you can tell from the title, this article was a chapter from a book written by a Japanese author Tetsuo Maeda, and translated into English, by a Japanese speaker. The book is titled The Hidden Army: The Untold Story of Japan’s Military Forces.I touch on this subject in an earlier paper: Epping Forest History Supporting Mine Sweeping Boats, primarily in Sasebo, Japan. “One little known fact was that elements of the Imperial Japanese Navy, never disbanded following the Japanese surrender in WWII, (renamed the Maritime Safety Agency-MSA) had been hard at work in the previous five years (before Korea), clearing mines from Japanese ports and waterways. (the RN name shore facilities the same as ships) dismantled the mine and learned it had magnetic triggering, the first know use in WWII. The British, between WWI and WWII had a very active RN minesweeping research program, and continued to develop mines and countermeasures, and were readying their LL Sweep Gear towed by minesweepers to detonate magnetic mines far behind the minesweepers using strong magnetic fields. The danger however, was that the minesweepers had to first pass over these bottom mines without detonating them. The LL Sweeps were in development, but not yet ready to deploy. The H.M.S. Borde was hastily fitted with a large electromagnet in the bow, and worked great until exposions endered it too dangerous. The C-in-C First Sea Lord Winston Churchill informed LCdr Bolt that Vickers had been ordered by the Admiralty to convert some Wellingtons to act as flying magnetic minesweepers, and that he had been appointed to navigate them over the minefields. It was thought the speed of the aircraft would clear it from the explosion without harm. The development story is quite good, and the testing with the magnetic trigger from the Shoeburyness mine trigger mechanism connected to flashbulbs, confirmed no pretriggers before the bomber was overhead. It was determined that the bomber fly at 50-70ft elevation, at 150 knots to clear the explosions. The safe depths were first set at 60 ft, but later reduced to 36 ft. The first mine detonated recorded a 3.5 g “bump” at the tail, they continued lower (below 35 ft), and had more success – but the the “bumps” were now recording 10 g’s on the accellerometer! These are quite interesting experiments, first as minesweeping progressed, these jobs were turned over to wooden minesweeping boats (and partially degaussed trawlers), when LL sweeps were designed for smaller craft. Larger minesweepers had too much draft for rivers. Some Luftwaffe Ju 52 floatplanes were also used as minesweepers, fitted with a large degaussing ring under the airframe. These particular Junkers Ju-52-3m were used as a minesweeper, and attached to the Minensuch-Gruppe, then based in France during 1943. The large ring was an electrified metal alloy affair built in sections that were supported with bracings under the fuselage and wings. Low voltage current was fed through the ring while the aircraft was flying over the water suspected of being mined by the Allies. The electromagnetic field generated by the minesweeping ring would explode any magnetic mines encountered. Based on the French coast, the Mine sweeping squadron remained operational until late 1944. Ted Sammon an All Hands writer wrote an article at the end of the Korean War on LSD’s, USN Landing Ship Dock ships utilized in a new role during Korea as mine sweeping mother ships. This concept was first developed by the German Reichsmarine in WWI, called Minenraummutterschiffe’s.They used obsolete dreadnaught battleships, (pre-1910), removed their massive guns topside, and replaced them with boat skids, where they carried 14-18 57′ motor launch-like boat minesweepers called F-Boote’s. These boats were carried to the mined areas, and launched via cranes ahead of the German fleet to clear a path to the Atlantic; The Allies (UK and America) planted the “North Sea Mine Barrage” consisting of several mine lines stretching across the Noth Sea from Scotland to Norway to bottle up the German Fleet and U-boats in the North Sea in WWI – and repeated this mining effort in WWII. The German Kriegsmarine used the same concept during WWII, using primarily modern cargo ships, Modifying a total of eight captured and two Kriegsmaring ships, designated MRS = Minenraumschiffe. The ballasting and launching of the LCVP’s directly into Wonsan harbor described in the article was changed in mid-1952 after North Korean artillery struck the USS Cabildo during this ballasting-deballisting process. Every boat had to stay manned while the well deck was flooded, until it was drained and sailor power chained the boats down with appropriate lumber supports. Later, the Navy changed the process to launch MSB’s by the use of the LSD’s cranes. 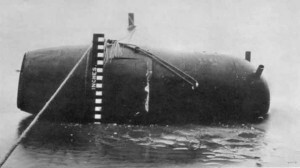 Four remaining LCVP’s containing heavy submarine batteries that powered their magnetic minesweeping cables, could not be launched by crane, because their plywood construction would not hold the weight of these batteries. Therefore, they were still launched out the stern gate of the LSD (Four Boats Only) with a partial ballasting. They would then back up to the LSD stern first to accept their 1,500 foot magnetic tails, previously flaked down in the well deck. See two previous posts on this Blog Aug 2, 2012 and Aug 9, 2012 including the movie of the LSD ballasting down in 1952. W.J Miller QMC USN, a writer for the USN All Hands Magazine wrote a nice 6 page story on the AMS minesweepers (136″) and the CoMinRon 3 Boat Division sweepers (36′) - Which were later redesginated as Mine Sweeping Boat Division ONE for the remaider of the Korean War. Following the Korean Armistice in August 1953, the unit became Mine division – 111 homeported in Sasebo. In 1958 it was further redesignated Mine Division – 33 and reorganized to report to COMINRON THREE/MINFLOT 1 Sasebo. Charlotte Knight, Colliers War Correspondent, produced a nice article (attached) on AMS operations of COMINDIV Three in Korea during a fall 1951 visit to these minesweepers. These were primarily YMS designs of WWII that were converted to Auxiliary Mine Sweepers, and given ship names. The YMS Series (>425) were only given hull numbers during WWII. Fifty keywords of ship names commanding officers and key personnel are also listed in the complete article.